During a media trip to Taipei, Taiwan for the Taiwan External Trade Development Council (TAITRA), I had a chance to stay at a very chill and laid back hotel called the Amba Hotel in the Zhonghshan area of Taipei. Not to be confused with the Songshan location, and I totally agree that this is very confusing. The Amba Hotel is part of the Ambassador Hotel family and is basically their answer to Starwood’s Element and Aloft properties. At least that’s what it appears to be. In fact, just down the street, there is a big brother Ambassador Hotel watching over little brother Amba. Amba Hotel had this fun and fresh vibe that really targets it well towards younger travelers looking for cool place to get a nights sleep after exploring all day. Plus, it has one of the best eateries in the area if you’re looking for more western cuisine incorporating local ingredients. I did much Instagramming thanks to the awesome presentation of the food. The team there really seemed to care a lot about the quality. TAITRA hooked me up with a huge (for Taiwan standards) balcony suite that overlooked the back alleys of the Zhongshan district, which is sometimes also known as the “red light” district of the city. The Amba Hotel is definitely a cool hotel concept as you’ll see in the video above. It joins two other locations in Ximending and Songshan. Both of which are in very hip and trendy parts of Taiwan. And I found it very easy to get a local SIM for my smartphone. 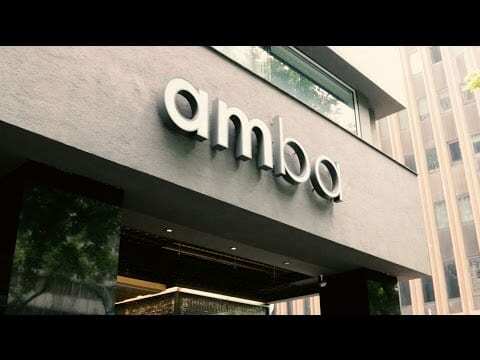 You can find out more about the Amba Hotel chain right here.